Filter Pads and Media Nothing lasts forever. Filter pads and individual components on your pump and filtration system will eventually need to be replaced. You'll find everything you need here. 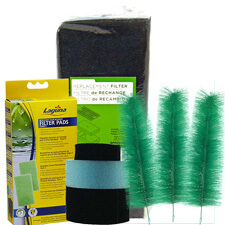 From filter mats, leaf nets for the skimmer, replacement impellers, and more. Nothing lasts forever. Filter pads and individual components on your pump and filtration system will eventually need to be replaced. You'll find everything you need here. From filter mats, leaf nets for the skimmer, replacement impellers, and more. Aquascape UV bulbs w/ballast: Aquascape replacement UV bulbs with ballast for use with UltraKlean Model Pressurized Filters. Aquascape UltraKlean Replacement Foam Large foam surface area provides increased filtration and bacteria growth. Works for both the UV unit and the non UV unit. Atlantic Filterfalls BF Model Replacement Mats provide excellent biological water filtration for your Atlantic Filterfalls BF waterfall filters.